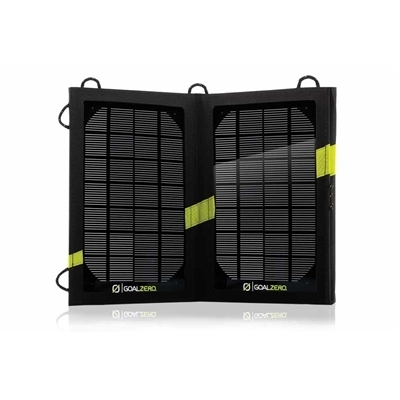 As portable solar arrays go, the Goal Zero Nomad 7 is not the lightest unit on the market at 14 ounces, especially when you add the Guide 10 powerpack with four AA rechargeable batteries (included) and various cords to top out at 24 oz. However, what you get for that sacrifice in weight is not only a large array that actually lives up to the manufacturer’s claim for charge times, but also one of the most versatile units on the market today. I have tested the Guide 10 kit from the beaches of Mexico to 17k feet on Denali’s West Buttress and have learned a lot about the unit in the process. The areas where the Guide 10 kit shines are threefold: power, durability, and versatility. The two large panels on the Nomad 7 provide plenty of power for backpacking needs. Goal Zero says that charge times of handheld devices off the Nomad 7 average the same amount of time as they would from a wall outlet and given good sunlight, my tests concluded this is true. My depleted Ipod and phone generally took about 4 hours to fully charge, give or take an hour depending on sun strength and cloud cover. The construction of the unit is great. The array folds into a relatively flat and compact 6.5 inch by 9 inch package that protects the panels and allows for quick and worry-free stowage. The panels are well-tested in extreme conditions so you will be hard pressed to break the unit. Sewn daisy chains allow for easy attachment to packs or tents and the integrated zippered mesh pocket keeps the power pack, cords and devices in one safe spot. The versatility of the unit is where it really shines. The charge hub on the Nomad 7 panels has 12 volt, USB and power pack outputs and allows the user to string multiple arrays together to form more powerful charging capabilities. The 12 volt output connects to a car charger hub so most any car charger cords you already own will work with the kit straight away. The Guide 10 portion of the array refers to a separate plastic unit that accepts 4 rechargeable AA (included) or 4 AAA with an adapter that is sold separately. Taking the power pack out of the array and creating a separate unit is brilliant in what it accomplishes. Without an internal battery you don’t have a proprietary part to replace once it has expired. Your power storage is only limited by the amount of batteries you want to carry, including the option to ditch storage all together if you want to lighten your load. Further, you can charge AA or AAA batteries for devices that require them (think camera and gps) which is not possible with most arrays that have internal storage. When you require power but don’t want to pack the panels you can charge up just the battery pack which will give you approximately 2.5 charges of an Ipod. This is great for weekend trips or stints at high camps where weight is at a premium. You can also use a computer or wall outlet (usb to mini usb or AC to mini usb) to charge the pack. I do have a few criticisms about the unit and depending on your uses they may be important to you. The Guide 10 power pack is only compatible with NiMH batteries which is frustrating as the world has reliably shifted to lithium ion. You can charge the power pack and another device simultaneously at reduced charge rates, but with only one USB port you can’t charge 2 devices without using a USB and 12 volt (car charger) cord. Finally, although Goal Zero seems to have solved their historic issues with charging smartphones, we now see that the controller power output is not strong enough to charge most tablets directly from the panels. You can get around this issue by charging your slate from the Guide 10 power pack but from 4 fully charged batteries you will on average only realize a 25% increase in a tablet battery. However, in the past I have used many other smaller and lighter solar backpacking units and although you can definitely shave some ounces with other models, they have never charged my devices in the amount of time the manufacturers claim they should. These smaller devices carry a small amount of panel surface area and with no batteries, or small built in ones, they are simply outclassed when compared to the Guide 10 package. Shop Goal Zero on Outdoor Prolink. Not a member? Apply today! Brad Miller is an Outdoor Prolink pro who loves skiing and being in the backcountry.